FARGO, North Dakota (CNN) -- Forecasters issued flash flood warnings for Bismarck and surrounding areas Wednesday, as volunteers rushed to fill sandbags ahead of expected record floods in the flat state of North Dakota. 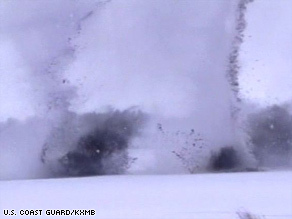 Explosives are set off in the Missouri River on Wednesday to break up ice jams. Areas of three counties -- Morton, Emmons and Burleigh, which includes the North Dakota capital of Bismarck -- were under a flash flood warning until 12:30 p.m. CT (1:30 p.m. ET), the National Weather Service said. In an effort to alleviate the flooding, demolition crews blew up an ice jam Wednesday evening south of Bismarck, according to CNN affiliate KXMB. Mayor John Warford said that water appeared to be moving more freely in the Missouri River after the explosives were set off, KXMB reported. The plan is make sure water continues flow through the river channel and not spread out over land. Ice jams in rivers have been a major factor in the flooding there. Most of the state, which endured a particularly harsh winter, remained under a flood warning Wednesday, with forecasters predicting possibly record flood levels on several rivers. Emergency officials said they were particularly concerned about the Red River, which snakes through eastern portions of North and South Dakota and western Minnesota. The river is expected to crest between 39 and 41 feet in Fargo on Friday, according to Cecily Fong of the North Dakota Department of Emergency Services. The record for the Red River at Fargo was set in 1897 at 40.1 feet, according to Pat Slattery of the National Oceanic and Atmospheric Administration. "There have been so many volunteers that we had to turn people away," said Ryan McEwan, a supervisor at one volunteer coordinating center. "It is very busy. They are filling sandbags as fast as they can." As of late Tuesday, Fargo residents and out-of-town volunteers had filled more than 1 million sandbags out of the needed 2 million. Fargo Deputy Mayor Tim Mahoney said he hoped that goal would be met by Thursday. Fargo's mayor, Dennis Walaker, said Wednesday that his city was about 95 percent prepared for the flooding, which is expected later in the week. "I went and looked at the dikes this morning, and they're significant, absolutely significant," he said in a briefing Wednesday morning. However, he said, "We have some areas we need to shore up." Just south of Fargo, authorities said they had rescued several people in Oxbow, a town of about 238 people, after a residential dike gave way. In some places, water had reached halfway up residents' basement stairs, and in others, it had reached the main level of homes, Sgt. Gail Wichmann said.